Societies world over are urgently seeking innovative approaches to address persistent social problems of health care, poverty, child labour, literacy etc. These problems not only persist but also have increased in intensity and complexity. Thus, there is furor for innovative entrepreneurial approaches that can create more social value with limited resources. These approaches need to leverage better on resources to enhance effectiveness through creative partnerships by raised expectations, performance and accountability so as to achieve more sustainable social impact. What business entrepreneurs are to the economy, social entrepreneurs are to society? They may, like business entrepreneurs, be interested in profit, but their emphasis is on social change. While the challenges in the social sector are many, the potential and opportunity for social entrepreneurship to be a powerful force for social value creation has never been greater. Through grounded research and in depth contextual analysis, this chapter focuses on India's genesis and development of social entrepreneurship. Peter Drucker argues that social entrepreneurs “...change the performance capacity of society” (Gendron, 1996, p. 37) while Henton, Douglas, Melville and Walesh (1997) write about ‘civic entrepreneurs’ as “...a new generation of leaders who forge new, powerfully productive linkages at the intersection of business, government, education and community”. Social entrepreneurs are reformers and revolutionaries with a social mission. They make basic changes to the way things are done in the social sector. The social entrepreneurs provide distinctive solutions for some new and some old problems. Social entrepreneurs see the world in a different manner. They give and provide sustainable improvements to the present day problems. So, what business entrepreneurs are to the economy, social entrepreneurs are to society? They may, like business entrepreneurs, be interested in profit, but their emphasis is on social change. They are often self-driven, creative individuals who exploit new opportunities, question accepted norms, and refuse to give up until they have remade the world for the better (Austin, Stevenson & Wei-Skillern, 2006). According to Schumpeter (1975), social entrepreneurs are very innovative and ought to be innovative as they are on the mission of providing new methods of solving problems that were holding the society since some time. Many at times it is said that social entrepreneurs are a special breed of people providing different solutions. But, the journey of social entrepreneurs is not a smooth one. 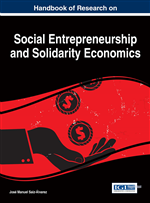 Social entrepreneurship can shortly be described as a construct that bridges business and benevolence by applying entrepreneurship in the social sphere (Roberts & Woods, 2005). Where traditional entrepreneurship involves the identification, evaluation and exploration of opportunities in order to gain personal or shareholder wealth, social entrepreneurs recognise, evaluate and exploit opportunities that results in social value (Certo & Miller, 2008; Austin, Stevenson, & Wei-Skillern, 2006). Marginalised Population: Marginalized populations are those excluded from mainstream social, economic, cultural, or political life. Creativity: Creativity is defined as the tendency to generate or recognize ideas, alternatives, or possibilities that may be useful in solving problems, communicating with others, and entertaining ourselves and others. Entrepreneurship: The capacity and willingness to develop, organize and manage a business venture along with any of its risks in order to make a profit. The most obvious example of entrepreneurship is the starting of new businesses. Social Entrepreneurship: Social entrepreneurship is the process of pursuing innovative solutions to social problems. Sustainability: Sustainability could be defined as an ability or capacity of something to be maintained or to sustain itself.